After the success of my first adventure novel, the public and my publisher demanded that I write another book. 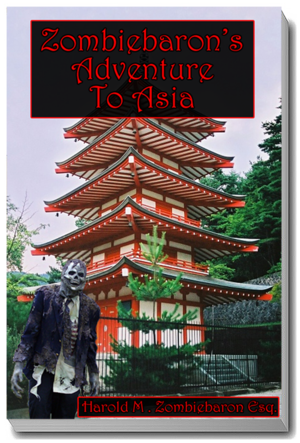 The book that you are now holding in your hands and reading with your eyes, entitled Zombiebaron's Adventure To Asia, written by me, the author, Harold M. Zombiebaron Esq., is that book. 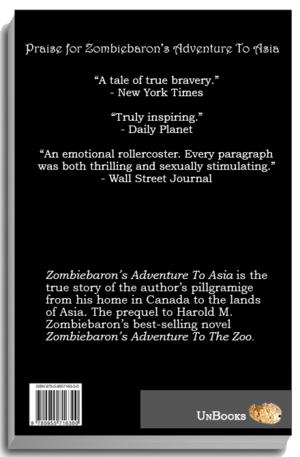 It is a prequel to the events that took place in Zombiebaron's Adventure To The Zoo because it is about things I did about a hundred years before that day when I got kicked out of the Toronto Zoo. As I explained in my other book, I am a real zombie. What follows is a true account of the time I visited Asia. A photo of me and my castle. Part I: Confucius Says, "A Journey Of A Thousand Miles Begins With A Single Step." It was a rainy day in February of 1845 when I decided to go to Asia. I remember because at the time I was still mourning the final death of my dear friend and fellow zombie, Henrik Steffens. That particular afternoon I was sitting in my favorite armchair whittling toothpicks in front of the fireplace. In those days I lived in a moderately sized castle, near where the corner of Yonge and Eglington is in modern day Toronto. I had built the castle myself over the course of the previous fifty years, and I was very proud of my handiwork. But that day in February, as I sat whittling and thinking about all my happy memories of Henrik, I started to feel a need to escape my surroundings. In my hundreds of years of life I have traveled quite extensively, and I have learned to trust my instincts, especially when they tell me to go on an adventure. So I got up out of my chair, found my suitcase, and began to pack for my journey. Packing wasn't very hard because as a zombie I have learned not to rely on material goods. So, I packed my toothbrush, my vitamins, and a copy of East of Eden by John Steinbeck into my suitcase, checked to make sure the stove was off, extinguished all the lanterns, locked the door, and set off for Asia. I chose Asia as my destination because I had heard rumors of a hidden city somewhere in the Himalayas and I felt fairly certain that I could find it, and I could sample the brains of various Asians along the way. It took me 15 years to walk to Japan, and most of that time I was under the Pacific Ocean. Me an my good buddy General Tsao. This photo was taken many years after my adventure to Asia. I stayed in Japan for 3 months before moving on to China. I found that the brains of Japanese people had a very enjoyable texture. At the entrance to China I was greeted by my old friend General Tsao. General Tsao was the best chicken farmer in his whole district. On his farm, where I stayed, there were three million chickens. I stayed with the General off and on over the next ten years while I roamed throughout China sampling brains. I really enjoyed my time in China. Human brains in that area have a very distinct rice flavor. At the same time I was gathering information about the underground golden city in the Himalayas. Eventually my room in General Tsao's farm house was littered with hundreds of scraps of paper containing mostly information I had gathered by torturing Chinese people to death. This was problematic, as I do not speak Chinese, but I was able to transcribe their nonsense phonetically and then General Tsao translated that to English as best he could. By about halfway through my ninth year in China the General and I finally had a clear idea of where I would be going next. We were able to discover that the city was named "Pandamonium", and the approximate location of a cave that was said to be the secret entrance to the city. Descriptions of the citizens of Pandamonium varied, but from what I gathered felt comfortable assuming that they were a fringe religious sect. At first Tsao and I had trouble inventing a method to reach the secret cave, which was very high and impossible to reach using traditional mountain climbing techniques, but then we remembered the chickens. Over the next six months the General and I built me a flying machine and prepared for my departure. The flying machine was essentially a deep wooden bowl, with a railing running around the lip. Attached to the railing were metal loops tied to ropes tied to chickens. There were enough chickens to lift me to the cave, and the railing and loop mechanism allowed me to steer. Finally I said goodbye to the General and set out for Pandamonium. 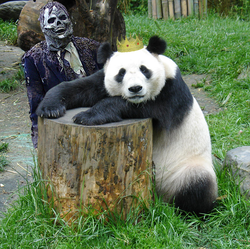 The Panda King posing for a picture with me moments before I ate his brain. The journey to Pandamonium was uneventful. The cave entrance was in sight and I was busy feeling proud of myself for accomplishing my initial goal of finding the city, when suddenly things started to get weird. I felt like there were tiny fingers sorting through my memories, scratching my brain with tiny invisible claws. I could not ignore the sensation and it grew stronger as I approached the cave. Finally, I was close enough to the cave entrance to exit my flying bowl. It was only then that I realized that what I had previously mistaken for rock formations were actually hooded figures. The figures, swathed in huge black robes, did not speak, but instead turned and walked deeper into that cave, motioning me to follow. As I followed the hooded figures, I noticed the walls of the cave were covered with huge murals of pandas fighting against humans. At the very back of the cave was a huge wooden door. My hooded guides stopped in front of the door and turned towards me. It was then that they removed their hoods. They were pandas! And they spoke! They said, in unison, without moving their mouths, "Welcome to Pandamonium. The king wishes to speak with you," and as they spoke the doors slowly opened to reveal a tropic rainforest inside a cave, and sitting in the center of the cave, on a huge wooden throne, a panda wearing a crown. "I am The Panda King," said the panda wearing the crown, without moving his mouth, "Welcome to Pandamonium." The Panda King explained to me that his people were telepathic pandas that had once lived peacefully with the nations of Asia, but that one day the humans had realized how inferior they were to the telepathic pandas and had slaughtered millions of pandas, driving The Panda King and his subjects into the mountains. Because he was telepathic, conversation with The Panda King was unnecessary. Instead he skipped right to the important stuff, "The pandas of Pandamonium are dying. In thirty years we will all be dead," The Panda King said to me without moving his mouth, "I have probed your mind and found that you are a kind and gentle soul. 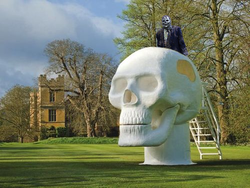 I would like for you to eat my brain. This will cause you to absorb a fraction of my telepathic power, which you then must use to awaken the latent telepathic powers in other pandas. Do you accept this mission?" I had The Panda King pose for a quick picture, then I ate his brain. It tasted like chicken. Overall my trip to Asia was extremely successful. 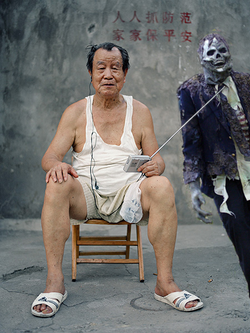 I found the hidden city, visited with my old friend General Tsao, and I also got to eat a whole bunch of brains. After I ate The Panda King's brain I stayed in Pandamonium for about a week, and then the remaining telepathic pandas used their mind powers to float me gently down to the ground. You're probably expecting I'll say something like "the journey home was uneventful, I got home safe, and then lived happily ever after." But that's not true. The trip home was very eventful. But that's a story for another time. This page was last edited on 28 December 2018, at 03:26.